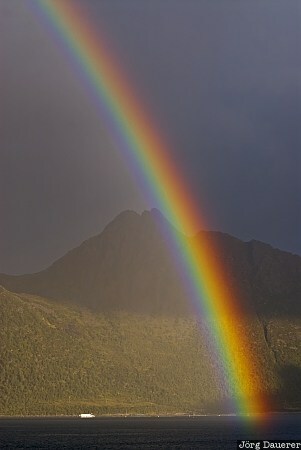 A rainbow over Melfjord with the misty green mountains of the island Senja in the background. Senja is in the province Troms north of the arctic circle in Norway. This photo was taken in the morning of a cloudy day in August of 2010. This photo is part of the exhibition Rainbow (February 2017). This photo was taken with a digital camera.